Video: What's been handed in as gun and knife amnesty continues across Leeds and West Yorkshire? A machete, knives, rifles and ammunition are among the items handed in so far as a 10 day weapons surrender continues across West Yorkshire. The weapons pictured have all been handed in to police stations in Leeds since the gun and knife amnesty began on February 22. But the running total will much higher as stations in Wakefield, Calderdale, Bradford and Kirklees are also participating in the Hand in Your Weapons campaign. 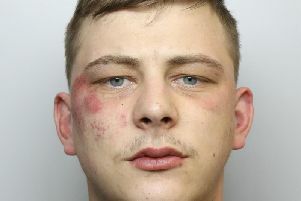 It is being backed by gun crime victim Christopher Wright, who had a shotgun fired at him at close range on his doorstep. The intended target of the shooting in April 2010 was his son, who had broken a car window in a dispute over a girl. Mr Wright said: "We lost our business, we’ve nearly lost our house three times, I couldn’t work for three years and I’m incredibly lucky to even be here and telling this tale. "This is an opportunity for people that might not necessarily think about giving up their weapons to hand them in. The weapons surrender is the third annual amnesty to be run by West Yorkshire Police. Last year's amnesty resulted in 230 weapons, including two AK47s, being handed in at police stations. Weapons can be handed at eight police stations across the county until Saturday, March 4. Anyone with information about the illegal possession or use of firearms is also urged to contact West Yorkshire Police via 101. You can also call independent charity Crimestoppers anonymously on 0800 555111.